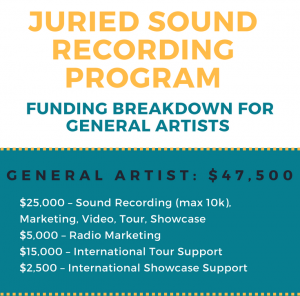 Here is a quick breakdown of the different funding maximums in each Juried Sound Recording Component for General Artists. The maximum funding available to artists rated General, which includes all artists applying to the JSR program for the first time, is a total of $47,500. Make note of the maximums that can be spent in each component. For further details on eligible costs, please see the Juried Sound Recording Program Guidelines. If you have any questions about this breakdown and how it works, reach out to your Project Coordinator!